Given how much anger there still is at Wall Street, the answer may be surprising. 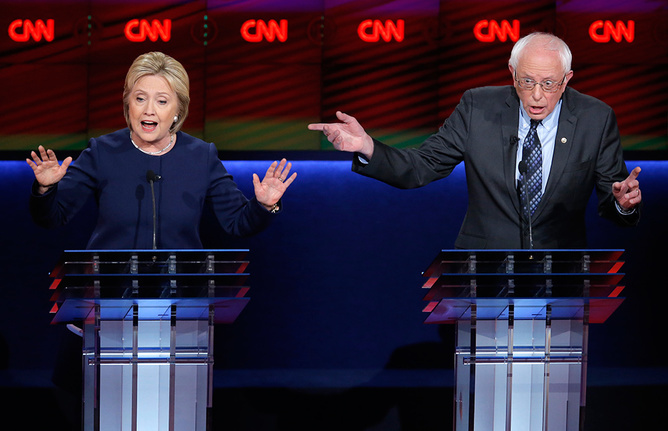 Clinton and Sanders have been trading jabs over who would be best to reform Wall Street. In a forthcoming research paper, we argue that major change has been so difficult because Wall Street’s top executives ensure that the authoritative voice on the financial industry remains theirs. In other words, no one else understands how it works, so no one else can tell it what to do. Consequently, other stakeholders, such as customers, investors, policymakers, academics, other businesses and society at large, have been sidelined. But how do the executives manage this? Based on systematic analysis of data from the Financial Crisis Inquiry Commission and media, we found that how industry elites use public rhetoric shines some light on this, revealing clear patterns. Our capital ratios and liquidity pool remained high by historical standards… Subsequent events show that Bear Stearns’ collapse was not the result of any actions or decisions unique to Bear Stearns… The efforts we made to strengthen the firm were reasonable and prudent. Throughout the financial crisis, we continued to support our clients’ financing and liquidity needs. For example, we helped provide state and local governments financing to cover cash flow shortfalls… JPMorgan Chase is also at the forefront in doing everything we can to help families meet their mortgage obligations. From a policy perspective, (the financial crisis) made clear that regulators simply didn’t have the tools or the authority to protect the stability of the financial system as a whole. Lehman’s demise was caused by uncontrollable market forces and the incorrect perception and accompanying rumors… Those same forces threatened the stability of other banks – not just Lehman… This loss of confidence, although unjustified and irrational, became a self-fulfilling prophecy and culminated in a classic run on the bank. 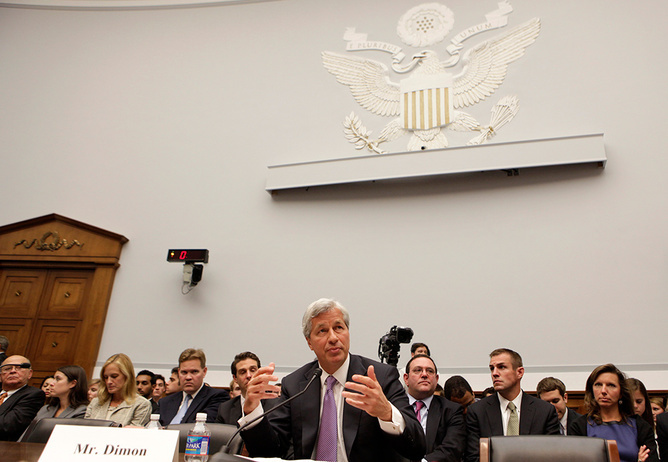 JPMorgan CEO Jamie Dimon has been on the front lines as an authority on Wall Street. In summary, industry elites rhetorically construct themselves as essential actors in the field due to their expertise in managing their organizations in a complex system and their trustworthiness in terms of caring for multiple stakeholders. Simultaneously, they sharply critique the failings and motives of others. This really matters because, in a domain that outsiders find difficult to understand, using such public rhetoric reinforces what social psychologists call “epistemic authority” – in this case the authority of elite financial industry executives. The idea is simple: those who are considered to have expertise and are trustworthy rank high on epistemic authority. Their voices carry more weight and acceptance on crucial matters related to their field. And those who are lower down in this hierarchy are unable to pose a credible challenge. Research from social psychology shows that those with higher epistemic authority on a subject are turned to earlier as a source of information, given priority, inspire higher confidence and are more likely to lead to actions that reflect their wishes. Hence this is how Wall Street can both be reviled by much of American society yet maintain its status as the primary authority on the financial industry. Challenging this authority requires strong political will. Campaign donations and lobbying play an augmenting role to ensure we don’t even get close to posing a credible challenge. “The Blob” of regulating agencies (from the Treasury Department to the Securities and Exchange Commission) moves together with an “army of Wall Street representatives and lobbyists that continuously surrounds and permeates them,” according to former Congressional staffer Jeff Connaughton. The result is that no credible challenge is mounted, and the epistemic authority of industry executives prevails. After the crisis, the Dodd-Frank act sent a signal that reform was needed, but it did not go far enough and in fact many parts of it are already under legal challenge from Wall Street. The diluted nature of these changes shows how much authority industry executives have acquired since the Great Depression. Many of the regulations imposed in its aftermath, such as Glass-Steagall, have been repealed. To reform the industry, some critics target its internal culture, creating the right incentives and capital requirements. While all these issues are important, how do we get started? Our research suggests the key obstacle to initiating radical change is that the top executives maintain the final word on “their” industry, while others whose lives are greatly affected by it have little voice. While other factors such as donations and lobbying certainly also play a role in preventing change, little attention has been paid to the importance of authority. It is this authority that allows them to reduce the power of the state to regulate their industry by using their perch as “experts” to question the government’s capacity to do so effectively. Fuld, for one, continues to defend the expertise of his Lehman team while blaming the entire crisis and his own bank’s collapse on the government. Such rhetoric contributes to an environment where state bodies have little authority to intervene in the industry in the first place, and the donations and lobbying take care of the rest. The financial industry also undermines tougher rules by taking key jobs at regulatory bodies – a problem known as the “revolving door” between Wall Street and Washington. Three recent Treasury secretaries, for example, were former executives at Goldman Sachs – hence Sanders’ concern about the foxes guarding the henhouse. Other academics have documented the disproportionate power of the financial industry on other businesses; about a devotion to financial industry practices leading to long-term erosion of investment, competitiveness and prosperity; and more broadly about how its practices have reshaped everyday life in society and contribute to socioeconomic inequality. But unless we can find a way to overcome the financial industry’s epistemic authority so true reform is possible, its negative repercussions on the economy and society will not change. And that is perhaps why many voters see presidential candidates’ independence from the financial industry as crucial. Among the many other salient issues, the fact that not much has been done to change things after a financial crisis that damaged so many lives continues to raise hackles. It also likely breeds resentment against a system that has allowed things to continue as if nothing happened. That may lead people to extreme positions against what they perceive as an unfair system and into the hands of outsiders who embody that anger. But voters may be confusing simple claims of independence – such as on donations – with actual substantive plans for reform. Beyond the claims, actual change will depend on who is able to challenge the authority of the industry elite. So here it may be more useful for voters to consider who each candidate would pick to lead the agencies charged with regulating the financial industry and advise the president on these issues. Sanders’ assertion that he’d steer clear of resumes that include Goldman Sachs tells us who he wouldn’t pick but not who’s on the short list. Thus, the key question is: who would put together the right team to counter the dominance of industry elites? A team comprising those who stand outside the immediate circle of top industry executives (i.e., no conflict of interest) and yet can counter their epistemic authority (i.e., with expertise and trustworthiness)? That will be tough. But creative ways of building such a team will be needed. Such efforts are essential to challenge the industry, push it to pay more attention to other stakeholders – as opposed to navel gazing – and ultimately lead to a more positive impact on the economy and society. Previous Previous post: Why do we pretend Supreme Court justices are anything but political officials?